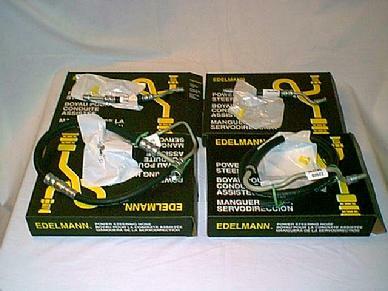 This Particular EDELMAN (Quality Name Brand), package will include ALL the hoses necessary to totally rebuild your Fluid delivery, and return system on your classic 6 CYLINDER 65 66 Mustang, 65 66 Fairlane, Comet power steering with the FORD PUMP. Buy it now Price is for the above mentioned Vehicles. We will need your year, model, engine size to fill your order with correct hoses. 67 68 69 70 Small block, AND BIG BLOCK Hoses are in another Listing. We will need your APPLICATION upon purchasing this package There is different hoses for certain applications. WE CARRY THEM ALL!! We want you to receive CORRECT FITTING pieces..
We specialize in Factory Disc Brakes, and Power Steering for the Early Pony Car FORD CARS!! We accept Pay-Pal, Money Orders, and all Major Credit Cards. 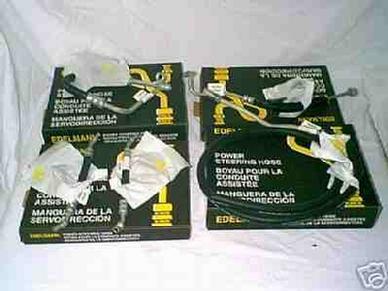 This Particular EDELMAN (Quality Name Brand), package will include ALL the hoses necessary to totally rebuild your Fluid delivery, and return system on your classic 6 CYLINDER 67 68 69 Mustang, 66 67 68 69 70 Falcon, 66 67 68 69 70 Fairlane, Comet power steering with the FORD PUMP. 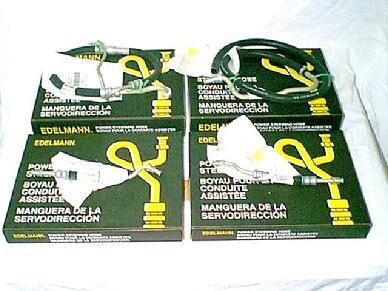 We will need your APPLICATION upon purchasing this package There is different hoses for certain applications. WE CARRY THEM ALL!! We want you to receive CORRECT FITTING pieces. On the 67 model years, it can have a 1/4" pressure port on the control valve, or a 5/16". Please check. This Particular EDELMAN (Quality Name Brand), package will include ALL the hoses necessary to totally rebuild your Fluid delivery, and return system on your classic 67 68 BIG BLOCK, and ALL 69 70 V 8 With the 2 part pressure hose system. 5 hoses total. 2 cylinder, 2 pressure, 1 return hose. This IS NOT A ONE SIZE FITS Pkg. Each Sale will be filled with EXACT FIT HOSES. THE SMALL BLOCK 67 68 PACKAGES ARE , and 6 cylinder hoses listed in another Liting. Yes, we have the 390-428 hoses, and are included in this auction.